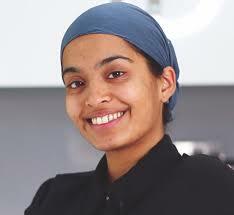 Jaspreet Kaur AKA Hipster Veggie is a UK based nutrition and wellness coach with a passion for skin care and menstrual health. With over 50,000 subscribers on her YouTube channel (Hipster Veggie), and winner of Google’s ‘NextUp 2018 Women to Watch’ competition, she is taking the social media by storm with her dynamic, holistic approach to health. Jaspreet uploads weekly content including easy to follow recipes, skin care regimes and tips for a healthy period. As one of the few Asian women sharing engaging content on often taboo subjects like menstruation openly, she is a trailblazer in this field and we are excited to get to know her a little more! Tell us a little about yourself and what you do. I am a YouTuber and holistic nutrition coach. I help my clients make healthier, daily choices without diets or restriction. Being healthy doesn’t mean you shouldn’t enjoy your food! What inspires you? Diabetes and heart disease are big problems within the Panjabi community and are attributed to lifestyle choices. There is a wealth of research proving that they are not only preventable, but also reversible. If we give our bodies the right tools to heal by eating the best foods for us. What books that have greatly influenced your life? 1. Frantz Fannon – The Wretched Of The Earth. 2. Weston A Price – Nutrition And Physical Degeneration. How has a failure, or apparent failure, set you up for later success? Finding my niche on YouTube. I created a lot of videos I thought would get me more views/subscribers. I didn’t enjoy the process and the outcome wasn’t as I expected. Once I began to do what I enjoyed and felt truly comfortable with the content, it naturally attracted the audience I wanted to engage with. If you could have a gigantic billboard anywhere with anything on it — metaphorically speaking, getting a message out to millions or billions — what would it say and why? This is tough, there are so many I want to write! But I think it would have to be a huge photo of ACTUAL untouched/unedited portrait images of a few women with NO make up on and the caption: “You don’t need make up or filters to be beautiful”. What advice would you give to a smart, driven college student about to enter the “real world? What advice should they ignore? Always be honest with yourself. Find out what your PASSION is and do what you enjoy. Find mentors and always listen and do what resonates. When you feel overwhelmed or unfocused, or have lost your focus temporarily, what do you do? I stress cook! I get into the kitchen, put on some music and cook with whatever ingredients I have to hand. Tell us something that would surprise us about you? I’ve never had a full time, 9-5 job for more than 10 months. I always start to feel suffocated, oppressed and uncomfortable. Self confidence! It is so easy to talk negatively to and about yourself. Sangat is the one thing that keeps me on track with this struggle. And I’m eternally grateful to my Guru for that.